Yellow with orange throat flowers and glossy dense foliage. Flowering: Majority of flowers appear early spring to early autumn. Some flowering may occur during winter in warmer areas. Habit: Excellent pot plant habit , with glossy dense foliage. Uses: Suitable for medium to large pots (300-400mm). Will perform best where winter temperatures rarely drop below 10oC. Position: For best results provide full-sun conditions. Planting next to a brick wall will greatly assist flowering during winter. Care: For growing in pot, use a good quality, well drained potting mix, that contains fertiliser. Do not allow plants to dry out. Prune plants after flowering to maintain shape and promote new flowers. 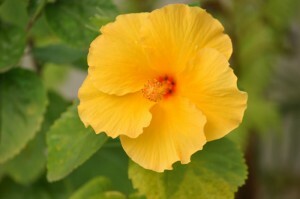 Propagation: A variety of methods are used to propagate Hibiscus rosa-sinensis. Some of the most common are: Rooting, Layering, and Grafting. Rooting: Cuttings are rooted in damp materials such as Perlite or sand, or sometimes even in just a container of water. Most “garden variety” hibiscus root easily, and this is a great way to increase a collection. Layering: This is another type of rooting, in which the branch is bent over and covered with soil. This sometimes happens inadvertently. Roots will form where the branches are in contact with the soil. After roots have formed, the branch is cut off and the new plant is potted or transplanted. Another form of layering is done by wrapping a section of branch in damp material, often spaghnum moss. That is secured with plastic or foil, and the area is kept damp for a few weeks. Roots will generally grow from nodes that were covered with the growth medium. A dab of rooting hormone may improve the speed of root development. Grafting: In this method of propagation, cuttings (called scions) are taken from a healthy plant, and inserted into cuts or notches made in a hardy root-stock plant. This method is of particular value when dealing with exotic hibiscus that produce great blooms, but do not propagate well by rooting. Quite a few show-winning hibiscus grow slowly or poorly on their own roots, and such cultivars are nearly always propagated by grafting. Interesting facts: Hibiscus rosa-sinensis is able to absorb nitrogen that make our lungs so relieved reason to consider this plant in top anti-pollutant plants.